A familiar refrain. Match drawn. But what a match it was. 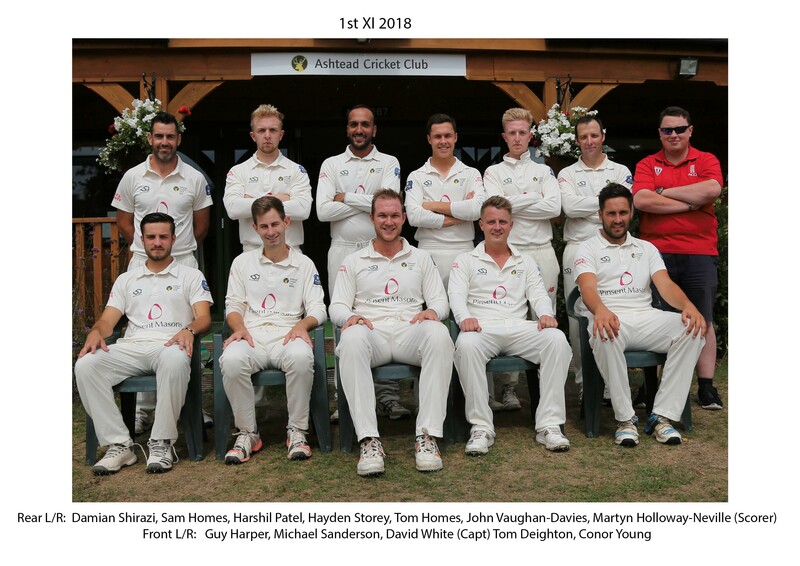 Ashtead secured the winning draw against 2nd placed Weybridge in Round 11 of the 2018 Surrey Championship Premier Division, after almost chasing down an unlikely score at Woodfield Lane. Ashtead won the toss and elected to field first, on a wicket that wouldn’t offer much early on and an outfield that would reward batsmen, rather than bowlers. And the hosts found the going tough in the early overs, with the Weybridge opening pair exploiting the pace of Harshil Patel and Rafeh Jafri, making his first outing for the Stags in 2018. 50 came and went, and with the score creeping towards 100, it would be the spin of Tom Deighton that made the breakthrough, Hayden Storey taking a composed catch to break the stand at 90-1. The next wicket would be huge, as the Weybridge overseas (New Zealand international Tom Bruce) came to the crease – and was bowled first ball by Jafri. Weybridge came to lunch at 92-2. Honours fairly even. By the 42nd over, Weybridge were 170-5, with Curtis on 93. Enter Odge Davey. He looked to attack from the very start, and the runs piled on as Curtis opened up. He reached his century off 131 balls, and continued to attack with abandon thereafter. The partnership put on 72 in 13 overs. The final few overs saw more attack, and the visitors eventually declared on 300-8 off 61.5 overs. A stiff test. Despite an early run out, the hosts got off to a flying start, with David White spearheading the charge. By tea, Ashtead were 61-1 off 11. Partnerships came and went, each adding roughly 40 to the score, but it was the loss of White for 61 that threatened to derail the chase. Losing Conor Young without scoring a few overs later seemed to have removed it completely. Enter Guy Harper and Hayden Storey. When the pair came together, the score was 126-4 with 27 overs left. Harper was 32 from 61. 16 overs later, Storey holed out to deep square leg for 64 off 54 balls. 98 runs in the partnership, and a chance for Ashtead to go for glory. 75 runs in 11 overs. The momentum, however, had begun to shift and a couple of tight overs made the task so much harder. Milestones, however, came and went. 250 runs, thereby claiming the final bonus point of the day. 282, the target for the winning draw. Harper’s century, off 134 balls, brought up in the final over. Ashtead finished 8 runs short of the target, 5 wickets down. The final partnership added an unbeaten 69. That result, combined with the results around the grounds, sees Ashtead gain a place in the Championship table and move to 7th, with a 21 point gap to the relegation zone. Next week sees Ashtead host Sutton in the penultimate timed match of 2018. Sutton won the limited overs encounter in Round 4, defending 235 by just 16 runs. Let’s see if Ashtead can turn a different result up. Join us then.